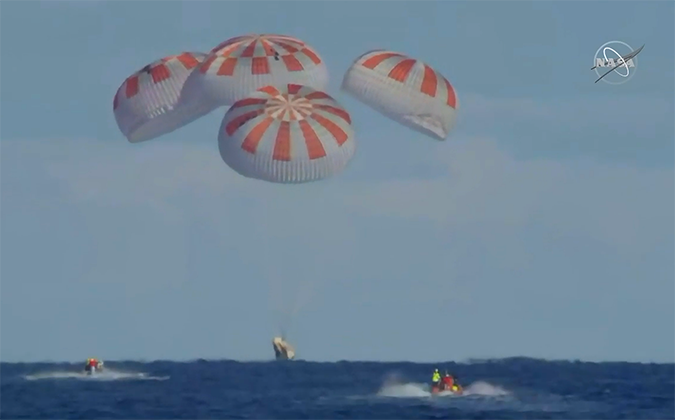 About 6 hours after departing the space station, Crew Dragon splashed down at 8:45 a.m. EST approximately 230 miles off the coast of Cape Canaveral, Florida. SpaceX retrieved the spacecraft from the Atlantic Ocean and is transporting it back to port on the company’s recovery ship. Demonstration Mission-1 (Demo-1) was an uncrewed flight test designed to demonstrate a new commercial capability developed under NASA’s Commercial Crew Program. The mission began March 2, when the Crew Dragon launched from NASA’s Kennedy Space Center in Florida, and racked up a number of “firsts” in less than a week. • First autonomous docking of a U.S. spacecraft to the International Space Station. NASA and SpaceX teams gathered in the early morning hours at the company’s headquarters in Hawthorne, California, to follow the spacecraft’s return journey and ocean splashdown. A critical step in validating the performance of SpaceX’s systems, Demo-1 brings the nation a significant step closer to the return of human launches to the space station from U.S soil for the first time since 2011, when NASA flew its last space shuttle mission. However, NASA and SpaceX still have work to do to validate the spacecraft’s performance and prepare it to fly astronauts. Crew Dragon carried a passenger on this flight test – a lifelike test device named Ripley, which was outfitted with sensors to provide data about potential effects on humans traveling in the spacecraft. After SpaceX processes data from this mission, teams will begin refurbishing Crew Dragon for its next mission, an in-flight abort test targeted to take place this summer. Demo-2, the first crewed test flight, will carry NASA astronauts Bob Behnken and Doug Hurley on the spacecraft’s final flight to certify Crew Dragon for routine operational missions.